Are Root Canals as Scary as they Sound? Root canals have an unnecessarily bad reputation of being painful, which causes many people to be afraid of the treatment. However, the team at our dental office in Nottingham wants to ease any concerns you may have about root canals and hopefully relieve any apprehension. There’s been a lot of talk surrounding just how terrible a root canal is when, in fact, advancements in dental technology have made them virtually pain free. If your dentist in Nottingham recommends a root canal, it’s most likely because you’re experiencing pain caused by deep decay or a severe infection. A root canal treatment can actually make that pain go away so you can finally get relief. 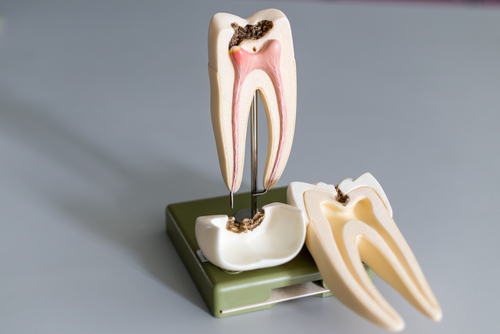 So, What Exactly is a Root Canal? Numb the area to reduce any discomfort. Make a tiny hole in the tooth. Gain access to the inside of the tooth. This is where the the pulp chamber and canals are located. Inside the canals, nerves, pulp, and blood vessels are found. Clean out all of the canal contents. Seal the pulp chamber and canals. Place a dental crown restoration to protect the tooth. Notice any of the symptoms listed above? We encourage you to call our dental office in Nottingham to schedule an appointment. A thorough examination by our caring and gentle dental team will help us identify the cause of your problem and recommend the best treatment for you. If the appropriate solution is in fact a root canal, we assure you that you have nothing to fear.